Pixar has been stuck in a rut for quite some time. Since Up in 2009, Pixar has churned out three sequels and only one new, original work. Toy Story 3 is a treasure but it is still one of the most overrated films in Pixar’s oeuvre. Can you honestly tell me the themes in Toy Story 3 weren’t already explored in Toy Story 2? The action-packed spoofing of the spy genre in Cars 2 made it better than the first Cars, but it still lacks emotional depth. The same rings true for Monsters University. Brave is the only original work but even that is a stretch considering it is Pixar’s take on the princess narrative. While none of these films are bad per se (I believe Pixar’s foundation is too solid to produce a truly bad film), they nonetheless pale in comparison to Pixar’s string of masterpieces which includes Toy Story, Finding Nemo, The Incredibles, Ratatouille, Wall-E and Up. However, after taking a yearlong hiatus since Monsters University, Pixar has returned stronger than ever with Pete Docter’s latest film, Inside Out. Inside Out is a comedy/adventure story that centers inside the mind of 11-year old Riley (Kaitlyn Dias). After she is forced to move from Minnesota to San Francisco with her family, Riley is no longer the happy-go lucky girl but a depressed and brooding pre-teen. Just to be clear, the story isn’t so much about that as it is about allowing yourself to succumb to your emotional rollercoaster. Controlling Riley’s moods and feelings are five anthropomorphized Emotions. The protagonist is Joy (Amy Poehler), a Tinkerbell lookalike except with a blue pixie haircut and no wings. Joy is the leader of the pack and it seems that Riley owes her endless optimism to the inexhaustible energy of Joy’s positivity. Sadness (Phyllis Smith) is like an adorably plush blue bubble that mopes around all day. Fear (Bill Hader) is wiry and acts way too caffeinated and cautious. Disgust (Mindy Kaling) is a beautiful green young woman who looks like she came from Clueless. Finally, Anger (Louis Black) is a short, red, square man with a Johnny Unitas haircut that shoots fire when provoked. Together they work at a central command module that can see what Riley sees. Apart from controlling the nobs and levers of Riley’s emotions, they also help archive her memories that are stored in glass spheres. These spheres are also color-coded based on the dominant emotion of that memory. They are all stored in either the Long-Term Memory library or remain at Headquarters, which is Riley’s consciousness. Together, these memory spheres form the essential parts of Riley, expressed as physical “Islands”. For example, Riley loves hockey so there’s an island solely dedicated to her favorite hobby. Things go terribly awry after Joy and Sadness are sucked out of Headquarters with Riley’s most important memories. Lost in the vastness of Riley’s mind, they must work together to restore order to her emotional well-being. One of the great things about Inside Out is that it feels less gimmicky than all the other Pixar films. The basic premise behind Monsters Inc., which was Docter’s first film, centered around the childhood fear of monsters residing in the closet. Docter took that universal imagination and carved a new world out of it. The premise of Toy Story and Cars work off of that principle too. Yet at the end of the day such fabrications are merely a product of the imagination. There are no monsters harvesting children’s screams for energy. Likewise, toys don’t form proxy governments when you’re not around. While Inside Out is also a product of pure imagination, it is also rooted in human nature. 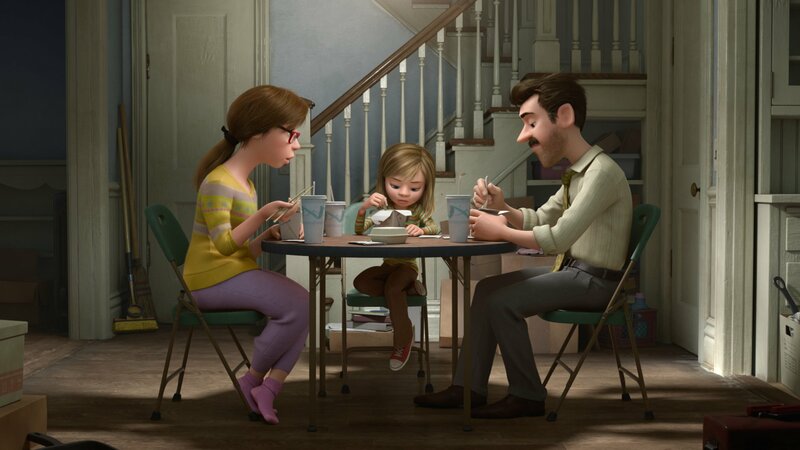 As Joy and Sadness pass through the various stages of Riley’s mind, including the Subconscious, the Train of Thought, REM sleep, Dreams and Nightmares, and so on, we can tell that Pixar is constructing an imagination that is still grounded in science and reality. (This is how you do a film about the mind, Christopher Nolan). This should serve as no surprise considering that Pixar prides itself on its detailed research. This could easily shackle the inspiration of lesser studios, but Pixar thrives and flourishes from it. 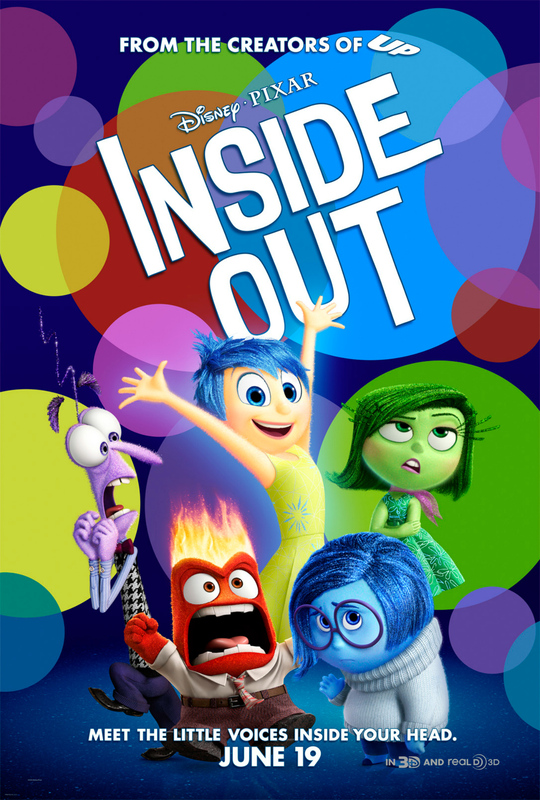 While Inside Out is both imaginative and real, it is also an emotional rollercoaster and a fun ride. A lot of its success is owed to the brilliant and inspired casting. The wonderful Amy Poehler channels Leslie Knope in Joy. I have to give credit to Poehler for managing to develop, again, such a positively uptight character without making her obnoxious and unlikeable. Mindy Kaling channels her Kelly Kapoor with Disgust, albeit in a more PG manner. If you’re familiar with Bill Hader’s work on SNL, then you can easily recognize him as Fear. Louis Black more than gets the job done as Anger. However, it is Phyllis Smith who steals the scene as Sadness. Smith plays the delightful but ultimate killjoy in The Office and she plays that to perfection in Inside Out. Like all of Pixar’s greats, Inside Out is packed with laughs. However, the film also takes the audience on an emotional journey that other films are often unable to do. It truly is a special achievement. As I mentioned earlier, Pixar has been on a bit of a decline due to the recycling of past successes. Yet, it is no coincidence that the man who has brought back Pixar’s resurgence is also one of the original founders and original members of the Brain Trust, a small creative team of leaders who oversee the development of their movies. Name your favorite Pixar movie and most likely it was directed by one of the four men who make up the Brain Trust: John Lasseter, Andrew Stanton, Pete Docter, and Brad Bird. These four make up the fabric of Pixar’s magic. Lasseter, whose childlike sensibilities and innocence are often compared to Walt Disney’s, forever changed computer animation with Toy Story. Of course, he has his near-misses as well (Cars and Cars 2). Stanton’s films are marked by the adversity his characters face in the intimidating vastness of nature (Finding Nemo and Wall-E). Bird’s films are the most intelligent and wittiest but they can also be guilty of being cold and pretentious (The Incredibles and Ratatouille). Finally, Pete Docter’s films tend to be rooted in basic emotional needs and are thus overly sentimental. The opening montage of Up is far more heartbreaking than any of Nicholas Spark’s books. His films also tend to be the funniest, too. While it is great to see Pixar back in form, it’s also alarming that the films directed by people outside these four haven’t been particularly notable. We’ll see how The Good Dinosaur fares later this year, an original film not directed by one of the Brain Trust. 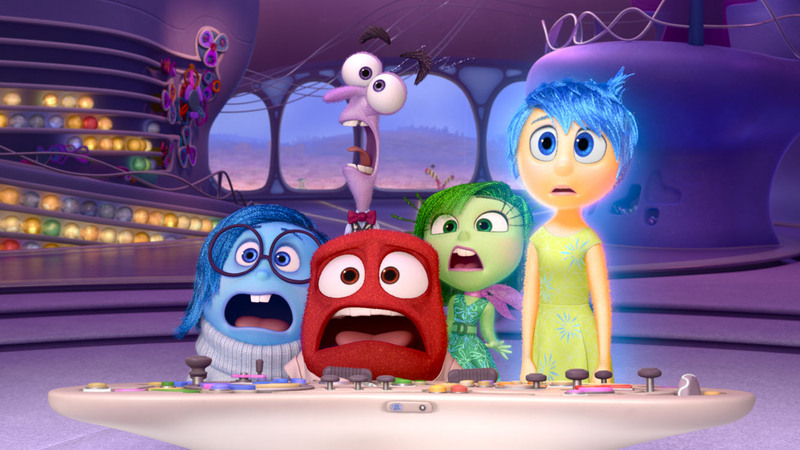 So where does Inside Out rank in Pixar’s long list of excellence? On my personal list of Pixar favorites, it would probably look like this: Ratatouille, Toy Story, Wall-E, The Incredibles, and Inside Out. It may have taken six years, but there is finally another film worthy to be in the same conversation as the greats.